After the Mad Banana incident last week I was a little nervous to see what would happen with Pierce's lunch this week. Luckily, things were just fine. Gleeful, in fact - just check out the Gleeful Watermelon! He also had roasted brussel sprouts with yellow squash. Recently Pierce declared that his favorite food is no longer shrimp - that it's yellow squash. Good thing we've got some growing in the garden! He also had some pizza with mozzarella, feta, kalamata olives, and some sneaky turnip greens from the garden (I'm always sneaking them into things I make like quiche and omelets). 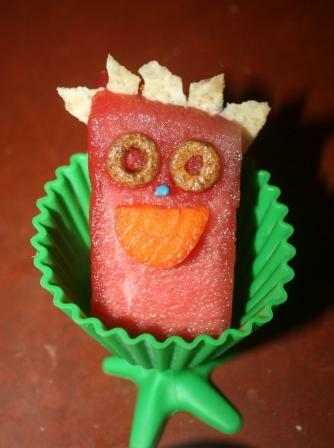 Doesn't Gleeful Watermelon look like he needs a guitar and a band? Maybe a Melodic Melon and a Tambourine Man Turnip? 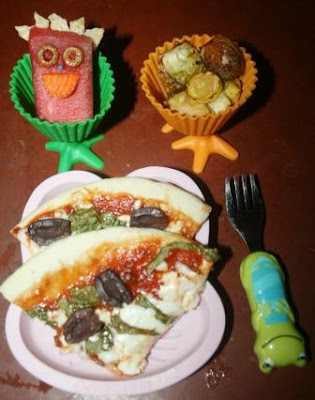 You can check out other fun ideas for kiddy lunches at Muffin Tin Mom. Pizza with sneaky foods is such a great idea! The watermelon is so cute. Love the muffin cups with the chicken feet. Too cute! Love the gleeful watermelon my dear! Sooo cute. The pizza looks yummy too! My rockin' rhubarb wants to be in the band! You are one clever lunch maker-I want some of that pizza! This is so creative and healthy! too cute and funny! Love it! Watermelon man would not have lasted long with me! lol Gleeful watermelon looks like one happy piece of fruit! How did you get those things to stick on him? You're a fun food genius!!! What wonderful food memories you're making. You are so sneaky! lol I suspect that he knows that you sneak those things into his food! lol Love the watermelon! He sure is rocking it and he does need a guitar. Oh, I love the watermelon snack. So totally adorable! I love that you made his lunch healthy but still SO much fun! hahaha yep a guitar is definatly what he needs!!! I love the little watermelon - could use some right now myself. A child who likes squash? Amazing! WOW I am always totally impressed by your MTM's. And I'm inspired. My kids would LOVE that rockin' watermelon.